The trend towards larger silhouettes and relaxed tailoring continues. Comfortable shoes and boots (such as flat Oxford shoes and knee length boots) align with the comfort trend. As do fun over-sized sweaters, slouchy pants and midi skirts. And practical, warm coats and capes. If you haven't updated your silhouette for a while, it's a good idea to do so this fashion season to ensure your look remains contemporary. Have fun experimenting, and realize this new larger silhouette may take a bit of getting used to if it's new to you, so pick 1 or 2 . As always, I recommend you pick shapes, lengths and colours that suit you, your lifestyle and your personality. Style.com neatly summarizes the key themes that I'm seeing. Click through the slideshow above to see the images. 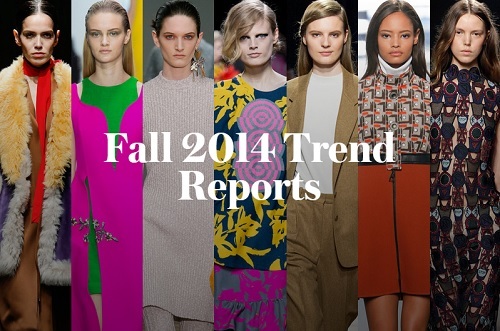 Follow Style-Makeover-HQ.com's board Fall Winter Fashion Trends 2014/15 on Pinterest.